Dark surface features previously considered evidence of subsurface water flow on Mars have now been interpreted as being the result of dry, granular flows, according to a Nature Geoscience paper. Planetary Science Institute Senior Scientist Jim McElwaine is a co-author on the paper. U.S. Geological Survey scientist Colin Dundas is lead author. The RSL appear seasonally, and appear to exist only on Martian slopes steep enough for dry grains to descend as they do on faces of active dunes. 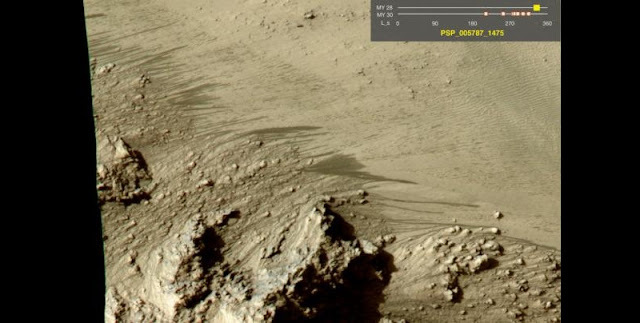 RSL, long bright or dark markings on the surface of a planet or moon, have long been thought of as evidence for significant liquid water on Mars. If they are actually dry grain flow phenomena, this suggests that recent Mars has not had significant volumes of liquid water at these slope areas, which could preclude the presence of microbial life thriving at these sites. Lovely Work, I like it very much.